As members may have been already aware, Immigration Judge Santen is no longer with the Boston Immigration Court. The Court is currently working to reschedule all of his cases and appreciates your patience during this process. Please give the Clerk's Office time to send out the notices before inquiring as to the status of a particular case. If you have an emergency due to this rescheduling process, please contact the Court Administrator. The recent changes in policies by Immigration and Customs Enforcement has made anyone undocumented a priority for arrest, detention, and removal, increasing the climate of fear among immigrant communities even more. More recently, the new administration has also ended the DACA program (Deferred Action for Childhood Arrivals,) meaning that unless Congress acts, the government is not accepting any new DACA applications and current DACA recipients will lose their ability to work legally in the United States and will be at risk of deportation once their DACA expires (over the next two years). In September, the administration passed a third travel ban, with a new list of countries whose nationals have been subject to restrictions or banned indefinitely from entering the United States on a nonimmigrant status. These countries are Yemen, Iran, Chad, Somalia, Syria, Libya, North Korea. Venezuelan government officials and their families are also banned from traveling to the United States. A federal judge in Hawaii blocked President Donald Trump's revised travel ban one day before it was set to take effect. But as of November 14, 2017, the Ninth Circuit let parts of the president's travel ban go into effect - preventing the travel of immigrants from Iran, Libya, Syria, Yemen, Somalia and Chad who do not have connections ("bonafide relationship") to the United States. The MGH Asylum Clinic was founded in 2017, and offers pro bono forensic medical psychological evaluations to asylum seekers in the U.S. To refer your clients to this clinic, please fill out the online forensic evaluation request form, which can be accessed at https://is.gd/mghasylumclinic. The Asylum Clinic is by appointment only and takes place every 1st and 3rd Monday of the month between 5-8pm. Starting on October 18, 2017, the Department of Homeland Security is collecting and storing social media information of all non-immigrants and immigrants, including permanent residents and naturalized citizens. Clients should review their social media platforms for inappropriate information and photographs; should screen who they friend/follow; and may want to delete all social media and/or information on dating sites. Client should screen "social media handles, aliases, associated identifiable information and search results." Social media information will be stored in the permanent files of all immigrants. ICE eService is only for the electronic service of documents to an OPLA OCC and does not allow for the electronic filing of documents with EOIR. To request access to ICE eService, go to eserviceregistration.ice.gov. Once you have received an invitation to join ICE eService and created your account, you will find additional information, including training videos on how to use ICE eService. For additional information, including how to register, what documents may be served, and terms and conditions of use, please click here. If you have technical difficulties creating your account, please email ICE at iceeservice@ice.dhs.gov. All clients should be aware that there is a new Form I-485, Application to Register Permanent Residence or Adjust Status. The form is now 18 pages, 5 of which are dedicated to inadmissibility questions! The I-485 instructions have been substantially updated as well. As a reminder, USCIS is automatically extending certain expiring EADs for up to 180 days for applicants who: properly filed for a renewal EAD before their current EAD expired, and are otherwise eligible for a renewal (EAD renewal is under a category that is eligible for an automatic 180-day extension (including asylum applicants and asylees) and the Category on your current EAD matches the "Class Requested." USCIS is doing this to help prevent gaps in employment authorization and documentation. There is an updated version of Form I-765, Application for Employment Authorization, to apply both for their work cards and social security numbers at the same time. This means that foreign nationals within certain categories can now get social security numbers without having to visit a Social Security office to submit additional documents. Attorney General Jeff Sessions appointed Jose A. Sanchez to begin hearing cases in Boston. Judge Sanchez earned a Bachelor of Arts degree in 1984 from Fordham University at Lincoln Center and a Juris Doctor in 1987 from Northeastern University School of Law. From 1995 to 2017, he served as an associate justice of the trial court for the Trial Court of Massachusetts, in Lawrence, Mass. From 1987 to 1995, he served as a trial attorney for the Committee for Public Counsel Services, in Cambridge, Mass. Judge Sanchez is a member of the Massachusetts State Bar. The ASC has relocated to: 7F Everett Street, in Revere, MA. All biometrics appointments are now held at the Revere location and not on Portland Street. Also asylum applicants are now assigned a specific date and time to appear for biometrics. They no longer have a two-week window. Please remind your clients not to miss the ASC appointment. -The Court held that detention based on an immigration detainer constitutes an arrest which must be authorized by MA law. -It observed that there was no authority under Massachusetts law - either statutory or common law - for an arrest for civil immigration purposes. -It declined to adopt the suggestion of the United States, appearing as amicus, that there was some "inherent authority" to arrest based on an ICE detainer, observing that those held on detainers do not have "the protections afforded other arrestees under Massachusetts law." -Specifically, detainers are issued without a judicial warrant and do not allow for a prompt determination of probable cause by a neutral magistrate. -The Court's decision applies to all Massachusetts law enforcement officials, not just court officers. -The Court declined to address the constitutional concerns raised by Mr. Lunn and the Attorney General, leaving that question for another day should the Legislature attempt to create statutory arrest authority. Many thanks to the Committee for Public Counsel Services for their representation of Mr. Lunn, their dedication to protecting the rights of immigrant detainees in MA, and also for providing us with this detailed update. Boston has, in light of the demand for more info pass appointments, recently indicated that it will start to add approximately 30 info pass appointments a month, including some appointments on Saturdays. The added appointments will be on Tuesdays, Wednesdays and Thursdays and begin on June 1. USCIS announced the extension of the designation of Haiti for temporary protected status (TPS) for six months, from 7/23/17 through 1/22/18. The 60-day re-registration period runs from 5/24/17 through 7/24/17. USCIS is reminding the public that the designations of Temporary Protected Status (TPS) for Guinea, Liberia, and Sierra Leone terminate effective May 21, 2017. Individuals with no lawful immigration status on May 21, 2017, will no longer be protected from removal or eligible for employment authorization based on TPS. Starting May 1, 2017, biometrics will no longer be taken by the Portland Street Address. The new address for the ASC is: 7b Everett Street, Revere. General Loretta E. Lynch appointed Sean D. Santen to begin hearing cases in April 2017. Judge Santen earned his law degree from the Indiana University Maurer School of Law. From September 2008 to March 2017, he served as an assistant regional counsel at the Office of General Counsel, Social Security Administration, in Boston, Mass. Judge Santen is a member of the Massachusetts Bar. On March 6, 2017, the President, by Executive Order, issued a new travel ban barring individuals from six Muslim-majority countries from entering the U.S. for 90 days, suspending the U.S. Refugee Admissions Program in its entirety for 120 days, and dramatically reducing refugee admissions this fiscal year. Several states have filed suit against the March 6th ban. Judge Watson, of the U.S. District Court of the District of Hawai’i, issued a nationwide temporary block to the revised travel ban. As of March 17, the 3/6 Executive Order will not be implemented. On February 20, 2017, the Department of Homeland Security (DHS) issued two memoranda with the purpose of implementing the President’s Executive Orders from January 25, 2016, titled Implementing the President’s Border Security and Immigration Enforcement Improvements Initiatives and Enforcement of the Immigration Laws to Serve the National Interest. Please see the DHS webpage for a copy of the memos and accompanying fact sheets. On February 3, 2017, Judge Robart, of the United States District Court for the Western District of Washington, issued a temporary restraining order and held that significant and ongoing harm was being inflicted on substantial numbers of people, to the detriment of the States, by means of an Executive Order that the States were likely to be able to prove was unlawful. On February 9, the Ninth Circuit denied the government’s motion for an emergency stay of a temporary restraining order regarding the President’s executive order banning entry into the United States from seven majority-Muslim countries. The President, through several Executive Orders, is focused on expanding border security, erecting a wall on the U.S. southern border, expanding immigration enforcement (terminating 2014 ICE priorities), imposing a travel ban on Muslim-majority countries, and suspending refugee resettlement for 120 days. 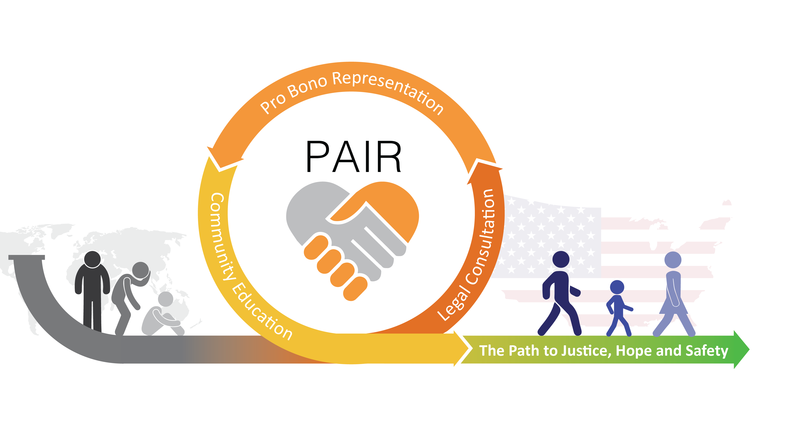 PAIR is committed to protecting immigrant rights and it’s asylum-seeker and detained clients. Please contact a PAIR staff member if you have any question about your status or your legal rights. DHS extended the designation of Yemen for Temporary Protected Status (TPS) for 18 months, from March 4, 2017, through September 3, 2018. The 60-day re-registration period runs from January 4, 2017, through March 6, 2017. DHS also redesignated Yemen for TPS, allowing additional individuals who have been continuously residing in the United States since January 4, 2017, and have been continuously physically present in the United States since March 4, 2017, to apply for TPS. The 180-day initial registration period for new applicants runs from January 4, 2017, through July 3, 2017. When new fees for most USCIS forms went into effect on December 23, 2016, USCIS also published updated versions of the forms at uscis.gov/forms. They strongly encourage customers to submit these new versions, which are updated with the new fees and have an edition date of 12/23/16. All filings postmarked 12/23/16 or later must include the new fees or the form will be rejected. Tomorrow, DHS will publish a final rule removing outdated regulations relating to the National Security Entry-Exit Registration System (NSEERS), an obsolete special registration program that required immigrants from 25 Muslim-majority, Arab, and South Asian countries to register their presence in the United States. This is a much welcomed step to ending the discrimination and surveillance of the immigrant community. In Matter of M-S-B-, a precedent decision, the BIA held that an untimely filed application for asylum may be found frivolous under INA §208(d)(6). The BIA then concluded that the respondent’s asylum application was frivolous, because the respondent deliberately made a false statement when he postdated by more than two years his date of entry into the United States. The BIA held that this was a material element in determining his eligibility to seek asylum given the general requirement to file the application within one year of the date of arrival in the country. Due to the diversion of an increasing number of asylum officers to conduct protection screening interviews for persons arriving at the border, there are significant backlogs in the scheduling of asylum interviews. Currently, the Boston Office is scheduling June 2013 I-589 receipts for interview. USCIS prioritizes asylum applications for interview scheduling as follows: (1) applications that were scheduled for an interview, but the applicant requested a new interview date; (2) applications filed by children; and (3) all other pending affirmative asylum applications will be scheduled for interviews in the order they were received, with oldest cases scheduled first. Please see the USCIS website for processing of asylum cases for more information. USCIS has extended Temporary Protected Status (TPS) designation for Nepal. This allows eligible nationals of Nepal (or persons without nationality who last habitually resided in Syria) to re-register for TPS, from October 26, 2016 through December 27, 2016. For more information and for all relevant filing dates, visit the USCIS website. As of October 2016, defensive applications for asylum may be filed directly at the clerk’s window or by mail. They are no longer required to be filed in open court at a Master Calendar hearing. This applies to all Form I-589s, regardless of whether the application is for asylum, withholding of removal, or protection under the Convention Against Torture. USCIS has redesignated Syria for Temporary Protected Status (TPS) and extended the existing TPS designation for the country from Oct. 1, 2016, through March 31, 2018. This allows eligible nationals of Syria (or persons without nationality who last habitually resided in Syria) to register or re-register for TPS. For more information and for all relevant filing dates, visit the USCIS website. As of July 5, 2016, the following policy will be in effect: If a request to reschedule an interview is made on or up to 45 days after the interview date, or if the interview has already been rescheduled on one (1) occasion, the applicant must establish there was “good cause” for the request. If the request to reschedule is made on or after 46 days after the interview and after a charging document or dismissal by the Asylum Office has been issued, the applicant must establish “exceptional circumstances” for failure to appear. .
On June 23, 2016, the U.S. Supreme Court issued a 4-4 decision in U.S. v. Texas. The deadlocked, one-line decision upholds the Fifth Circuit’s decision preventing the implementation of DAPA (Deferred Action for Parents of Americans and Lawful Permanent Residents) and expanded DACA (Deferred Action for Childhood Arrivals). The decision does not change the DACA (“Dreamers”) program that started in 2012. USCIS has confirmed that biometrics for court cases will be run automatically. Attorneys should work with ICE to determine the proper process for the refreshing of fingerprints for applicants in EOIR proceedings. Call the Office of Chief Counsel (OCC), 617-565-3140, and ask if the office is able to run your client’s the biometrics. If you have a case where your client has never had biometrics, you should request a biometrics appointment by mailing a request to USCIS or making an InfoPass appointment. The Asylum Office’s Affirmative Asylum Procedures Manual (AAPM) has been updated. The manual provides information on how to process an affirmative asylum application within an Asylum Office and is useful to review as you prepare your client for an asylum interview. Please see USCIS for more information. If you need to supplement your client’s asylum application after submitting the I-589, you should submit all supplementary materials to the Asylum Sub-office three (3) business days before the interview. Walk-in hours for document SUBMISSION ONLY are Monday – Thursday, from 8:30 a.m. – 12:00 noon. Walk-in hours for inquiries (including document submission) are on Fridays, from 8:30 a.m. to 12:00 NOON. Please note that filings documents on M-TH will take second priority to applicants being checked in for scheduled interviews. USCIS has amended the requirement for the number of copies of Form I-589 and related documents. They are in the process of updating the instructions for Form I-589 to reflect this change. USCIS now require: (a) 1 copy of your signed, original Form I-589; (b) 1 copy of any supplementary sheets and supplementary statements; and (c) 2 copies of any additional supporting documents you choose to submit. For more information see, https://www.uscis.gov/i-589. To access PAIR's legal resources, please see our LinkedIn page. For information on asylum or detention issues, please contact a member of the PAIR staff. or becoming a pro bono partner.